What you are seeing in this photo is the signing of the deed to the Stepping Stones House over to Family Promise, given as a gift. Through your help, and donations and grants from other sources, we are able to start renovation work on this house in October. We are in the last month of this campaign and we are a short distance from our goal of having the house completed in time for really cold weather. The demolition of 352 public housing units in Gainesville has drastically reduced affordable low income housing. The families ready to graduate from Family Promise can't locate affordable housing and that's where the Stepping Stones house comes in. They will rent this property while still attending classes through Family Promise. Family Promise will save their rent money after utilities are paid so they will continue to see a nest egg grow. And when they can locate a suitable apartment or home, they will have money for rent and utilities deposits and first month's rent. Please donate and help us GET OVER THE HUMP! Thank you all so m uch. 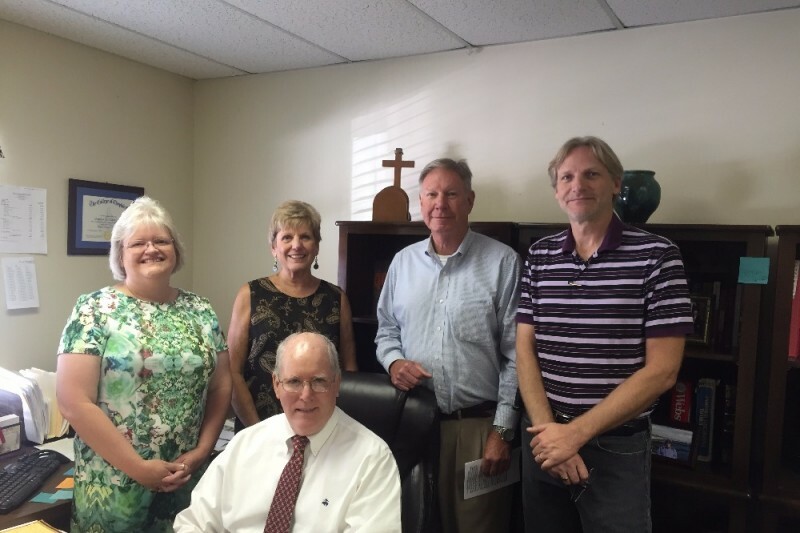 This photo is of the Pastor, Ed Cook, and Trustees, Van Thornhill and Allen Green who have just signed the deed of the Stepping Stones House over to Family Promise of Hall County. Witnesses and notaries, Darlene Grizzell and Claire Bagwell are to the left. This gift of the Stepping Stones house to Family Promise is a huge help in providing transient affordable housing for those fmailies graduating from the Family Promise Program. The demolition of 352 public housing units with those families searching for affordable low income housing, has made it difficult for graduates of the Family Promise Program to find a place to rent. Renovation work starts in October on the house. Help us over the hump! Please! Thank you for helping end homelessness for a family. We are please to tell you that due to your donations, we have been able to purchase the remaining electrical material needed to wire the Stepping Stones House to end family homelesness. The electrical supplies have all been delivered and a work schedule is being set to complete the installation of new electrical for this house. This is a big project because we have not only paid materials but donated materials, paid labor and donated labor, and everything has to come together at once for this to work. But it's being done! Thank you, again, to everyone who contributed money for the materials,materials, their time and labor. Insulation is next and we are praying that we have some new donations of cash of materials so we can complete this next big step. In the past 8 days, we have had 9 donations to our ending Family Homelessness fundraiser. We are excited and thankful for the donations from these kind people. Won't you join us, by making a small donation? If you can do even $5 and share and encourage your friends to match your gift, we will be well on the way to taking care of the purchase and installation of much needed insulation for this house. Please contribute and share now. We may be a small church of only 100 members, many who are retired and on fixed incomes, but we believe mightily that the Holy Spirit will touch the hearts of people and help us get this mission completed. Thank you so much. This home is being renovated by Flowery Branch UMC to provide shelter for homeless parents and their children as they work their way back to wholeness in the Family Promise Program. The home belongs to the church and we are responsible for the cost of renovating it. When completed, we will turn it over to Family Promise of Hall County so they can place a family in it. This small church of 100 members has taken a big step of faith that God will help us come up with the money to complete this project, which was estimated to cost $110,000. We are $22,500 away from finishing the house. Like in a marathon, I guess the last few miles are the the toughest. PLEASE HELP US GET TO THE FINISH LINE! Much progress was made this week as the Trustees met Thursday night and approved payment for electrical materials so the electrical work could start. The Buford United Methodist Men have contributed much in the way of electrical materials to us, but we did have pay for the rest of the needed items and were able to pay for that from donations received. We really need your help in donations during these coming months, as these are the months when it will be easiest for us to get work done on the house. We have many people willing to donate their time to help this renovation occur, but we are in need of funds for materials. Immediately after the electrical installation we need to put insulation in the house. We need several thousand dollars for this. If everyone who sees this could send us $10, we could get this done next. Thank you for your help. Please contribute and share.